New Delhi: IFFCO, India’s largest cooperative organization for, has set out its Vision to empower rural youth by not only polishing their employability skills but also assisting them in employment using technology.To make this vision actionable, IFFCO recently partnered with Youth4work, India’s leading online talent platform for youth, to create “IFFCO YUVA” – a platform for Rural Youth under its Indian Cooperative Digital Platform. At a stellar gathering of nearly 1500 people in Bareilly, Santosh Gangwar (Minister of State for Finance in Govt. 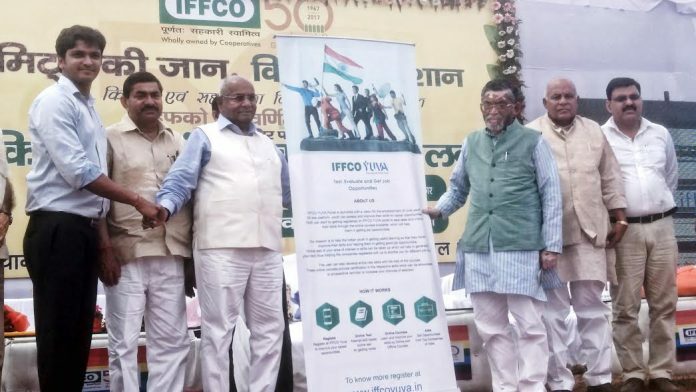 of India) officially launched “IFFCO YUVA”. Through this platform, youth can self-assess and improve their skills for better career opportunities. This platform be a single window to empower rural youthto understand various skills related sectors and prepare for related career opportunities offered by companies. For youth, it is a simple process to start exploring new career avenues. First they register on the portalwww.iffcoyuva.in, then they take online tests of their area of interest or skills which will help over 15000 companies shortlist them for different job roles. Youth can do this through IFFCO YUVA’s dedicated mobile app as well in case they do not have access to computers. Users can also learn new skills through easy and low cost but effectiveonline courses. Youth will also get access to one free course in English Language for life time to learn and improve their employability. Nearly 70% of India’s population is Rural and most of it is involved in agriculture & allied services and other limited vocational skills services.The rural workforce has been migrating to urban areas due to limited access to information and technology that impact their skill enhancement and career opportunities.IFFCO YUVA aims to impact nearly 10 Million youth in next three years across Rural India and build a competitive skill equity.